As the days start to warm up in the Central Valley of California, many of our agricultural accounts will be bringing out bee boxes to help pollinate the different nut crops and assorted field crops. Bees are usually brought to the fields or orchards in white commercial bee boxes and are not likely to sting when gathering nectar or pollen. While beekeepers take precautions when handling bees, our employees may find themselves in a situation where they disturb a nest and could be at risk for being stung. There are two different types of bees Africanized honey bees and European honey bees. While we’re not likely to actually be able to differentiate between them visually, both types of bees sting once and the effect of the sting is similar. Africanized honey bees like to build nests in areas that are protected from the weather while European honey bees may nest in open trees, old cars, building pipes or even underground. Some honey bees are very protective of their young and will respond quickly by stinging a person in the nest area or by merely walking within 50 feet or more of the nest. Vibrations from motorized equipment may disturb the bees at distances of 100 feet or more. 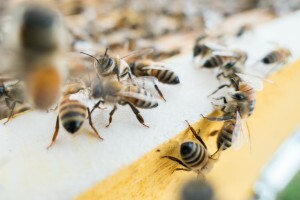 Africanized honey bees will continue to defend the nest for up to a quarter mile. Areas around the work environment or your home that could be potential hive locations also include storage sheds, wood piles, empty containers, air conditioner, barbeque grill, chimneys, eaves or rain gutters. They also may nest in mailboxes or attics. Last year at my own home, we had a swarm of bees suddenly appear near the eaves of our backyard patio. We deduced that for some reason the queen bee decided to stop in this spot and all of the worker bees followed her to the area where we had a pretty significant swarm. We called a beekeeper who brought over a commercial hive in hopes that we could get the bees to go in on their own. The hive sat for a couple of days and on the third day the beekeeper came back and ended up donning his personal protective equipment and then scooped the bees up to encourage them to go inside. In doing so we hoped to move the queen since if the queen goes, they all will go. We ultimately had success in relocating the bees inside of the hive, then the hive was removed from our home. Don’t hesitate to act should you experience allergic reaction-type symptoms as they could be deadly in as quickly as 30 minutes. “BEE” SAFE!